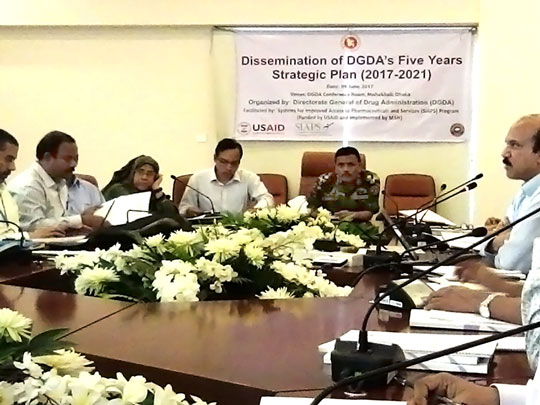 On June 8, 2017, SIAPS disseminated the Directorate General of Drug Administration’s (DGDA) five-year Strategic Plan (2017-2021) in the presence of the Honorable Major General Mohammad Mustafizur Rahman, Director General of DGDA. The dissemination of this plan is the result of a year-long process. In March 2016, WHO engaged with various stakeholders (SIAPS, USAID, the Bill & Melinda Gates Foundation, International Vaccine Institute, US Pharmacopeial Convention’s Promoting the Quality of Medicines (USP-PQM) Program, and the World Bank) to develop a road map and strategy to coordinate efforts to strengthen the country’s regulatory systems. One of the defined key activities was the development of a five-year strategic plan aimed “at strengthening medicine regulatory systems in Bangladesh by addressing the weaknesses and threats following seven strategic goals.” These goals include ensuring an appropriate legal and institutional framework, mobilizing adequate financial resources, and ensuring operation of a functional quality control laboratory. The strategic plan was greeted positively by participants. Managing directors of Popular Pharmaceuticals and Incepta Pharmaceuticals indicated that “the timely initiative DGDA took is commendable,” adding that they wish to see DGDA among the strongest regulatory authorities in the country. The Bangladesh Association of Pharmaceuticals Industries (BAPI), one of the main stakeholders of DGDA, underscored the tight timeline and highlighted the need for support and training to establish the Common Technical Document format for online medicine registration in their companies. Major General Mohammad Mustafizur Rahman appreciated SIAPS’ commitment to DGDA’s activities and wishes for a completion of the strategic plan within the time period. Thirty participants , including representatives of USAID, USP-PQM, WHO, the Ministry of Health and Family Welfare, executive members of BAPI, representatives of pharmaceutical companies, and all directors of DGDA attended the event.